CIMCO NC-Base is production centric, designed to be used by people in the programming department and on the shop floor. 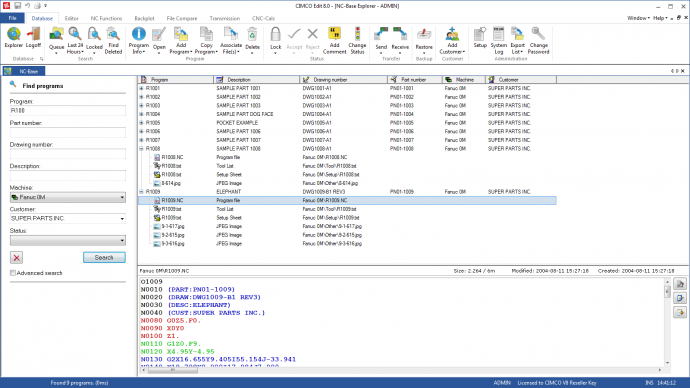 With NC-Base CNC programmers and production staff can assemble virtual folders containing all the necessary data used by machinists, operators, quality staff, and others who are responsible for finished parts. Why just send CNC programs to the shop floor when you can also provide setup sheets, tool lists, images, and other vital information required to manufacture parts? This information may be accessed from PCs running the NC-Base Client or printed out for manual distribution. Either way, NC-Base helps ensure the right part gets made right every time. CNC operators can access and update the database directly from the CNC control, or any PC on the shop floor.